The front elevation – what the shape looks like from the front. When designing a new building, an architect will construct detailed drawings of the plan and elevations of their building. Sometimes having these 2D projections to look at makes it easier to understand the structure of more complicated structures. In this topic, we will look at going in both directions – i.e. we will be given a 3D shape and be asked to draw the plan and elevations, and we will be given a set of projections and be asked to construct the 3D shape from them. We’ll have a look at both. Example: Draw a plan, a front elevation, and a side elevation of the 3D shape below. This is a typical example of a shape you would be given in a question on this topic – one made of a series of 1cm blocks. It allows us to clearly get the dimensions of our projections right. 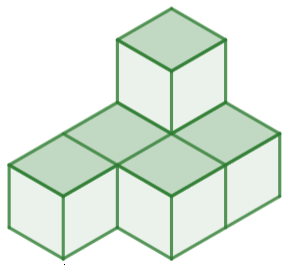 So, if we were to look at this shape from above, then we would see the L-shape very clearly – 3 blocks long and 2 blocks wide (at the base of the L). Then, if we were to look at it from the side, all we would see would be the base of the L – 2 side-by-side 1cm blocks. Finally, if we were to look at it from the front then all we would see would be the length of the L – 3 side-by-side 1cm blocks. 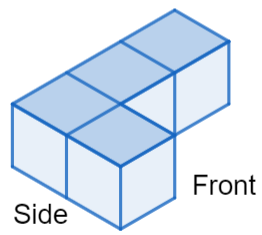 Whilst there is a block that juts out at the front, its important to remember that these 2D projections have no depth, so it makes no difference that one of the blocks would in reality be slightly closer to you, all that matters is what you would and wouldn’t be able to see. 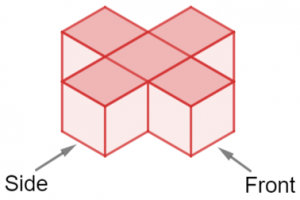 Example: Construct a drawing of the 3D shape described by the plan & elevations below. To do this, we’ll think about each projection one-by-one and consider what it means. We’ll first consider the plan – here, it gives us a good idea of the general shape of the object (a P shape, sort of). Then, we can ask what level each part of the shape is on (since we can’t know the height of a building just by looking at it from above, for example). 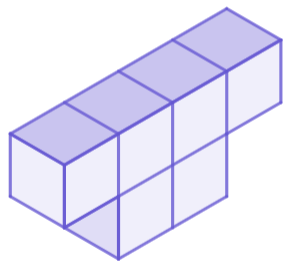 We can see by looking at the side elevation and front elevation together that all the blocks are on same level apart from 1, and that is the block to the right and at the back of the shape. So, now we know where all the blocks are, we can construct the shape. The result should look like the picture below. There’s no real trick to answering these questions, it just requires you to get to grips with how 3D shapes look from different angles and being able to picture them in your head. If you’re struggling, it helps to try making shapes with physical blocks and seeing how they look from different perspectives. 1) Draw a plan, a front elevation, and a side elevation of the 3D shape below. As we can see, the shape is one block high and is the shape of a cross, or letter x. As a result, the plan is going to be the shape of a cross, and both elevations will only be one block high. Furthermore, we can see that in looking both from the front and from the side, the shape in question is 3 blocks wide, so the resulting elevations will both be 3 blocks wide and 1 block high. All 3 projections are as seen below. 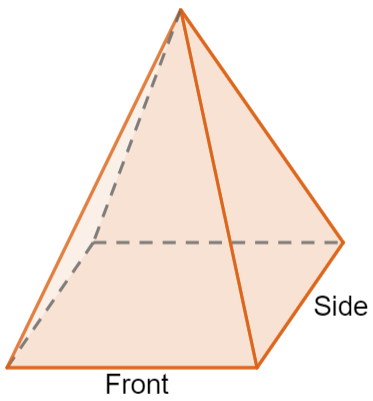 2) Construct a drawing of the 3D shape described by the plan & elevations. Whether you are a GCSE Maths tutor in Leeds or a Maths teacher in London, you will find our enlargement and projection worksheets really useful. The enlargement revision sheets can be used as a started at the beginning of a session or could be set as a homework to support learning after the lesson. With Maths Made Easy you will find exceptional GCSE Maths resources for all topics.